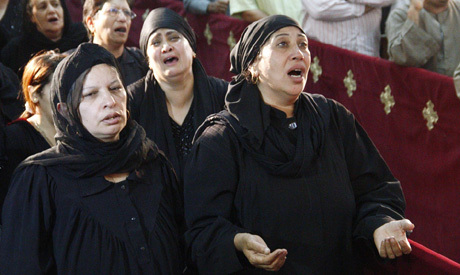 Families of victims of the Church Warraq attack, (Photo: Mai Shaheen). The Church of the Virgin in the Geziret Al-Warraq district was teeming with guests. A wedding had just finished, and another was about to start. Guests were standing outside the church gate waiting for the bride, Catherine, who had just finished at the hairdresser and was about to arrive. As the expectant guests stood chatting with each other, waiting for the couple's 8:30 arrival, two gunmen on a yellow motorcycle shot by and opened fire indiscriminately on them. The attack lasted only a few minutes, but by the time they were done, the church floor was soaked in blood. Four victims, including two girls aged eight and 12, were shot dead, and at least another 18 were left injured. On Monday morning, there were no more wedding bells in the church, which had transformed into a wake venue. Mourning women, dressed in black, sat in rows waiting for the coffins of the deceased to arrive. Um Ramy, who sat forlornly on a pew at the front of the church waiting for the funeral to begin, said her husband, Samir Faheem, along with three other relatives – his aunt, niece and grand-niece – were killed in the attack. She was standing amongst the guests when the shooting took place. "We became hysterical and started running everywhere. We almost trampled over each other in fear." Some guests sought refuge inside the church, while others fled screaming into surrounding streets. "We found bullets beneath our feet as we waited for them," said Um Ramy, shedding tears. Coptic Christians, who make up some 10 percent of Egypt's 84 million, have long complained of discrimination and periodic violence by extremists. But the number of sectarian attacks has surged following a security crackdown on Islamists in mid-August. Amnesty International, a London-based rights, group, said that upwards of 200 Christian-owned properties have been attacked and 43 churches torched or seriously damaged across the country, adding that at least four people have been killed. But most of the vandalism of homes, monasteries, Coptic schools and shops took place outside the capital. While the victims of Sunday's attack were all from the same family, Um Ramy seemed to have ruled out a revenge kill directed at her husband and his next of kin. "My husband did not have any issues with anyone. He was very amicable and peaceful." Father Dawood Ibrahim, the head priest of the Church of the Virgin, said that he got a call shortly after the attack began. "I came running to the church and found chaos everywhere," Father Ibrahim said. "I was really shocked." "There was blood on the floor and the bodies were everywhere," he said. Ebram Wagdy, a church employee, said a private vehicle blocked the road some 300m away from the church gate in order to allow the assailants to flee. Waleed Ahmed, another eyewitness who was sitting at a café outside the church, echoed the same account. "When they fired, there was no traffic at all in front of the church. All the cars were trapped behind that vehicle," Ahmed remembered. "Suddenly, a yellow motorcycle with two gunmen on it whizzed by, shooting at people standing in front of the church." Local residents say the area has seen virtually no security presence after police raided two major Cairo protest camps set up by loyalists of deposed president Mohamed Morsi, leaving hundreds dead and setting off days of deadly street showdowns. Eyewitnesses noted that police and ambulances on Sunday arrived almost two hours after their numerous distress calls. Since then, Wagdy said, some of those participating in passing Islamist marches have threatened to attack the church. Even so, he said, Muslims and Christians in the area have peacefully coexisted. "I have been living here for 15 years and have never witnessed a single fight between a Muslim and a Christian," Magdy added, saying that Muslims have even joined Christians in protecting the church during times of violence. Father Yustos Kamel, who has served in the church since it was built 12 years ago, denied reports that the church was previously threatened by extremist Islamists. "The Virgin Mary appeared in this church two years ago, and Muslims came to celebrate with us," he says. "And whenever Morsi followers pass by the church, Muslims help us and create a human shield to protect the church from attack." Following massive protests against his turbulent year in power, Morsi was toppled by the army on 3 July, sending the country into a bitter political deadlock. Islamists, incensed by Morsi's ouster, have accused Christians of backing what they call a coup against the country's first freely elected president. Coptic Orthodox Pope Tawadros II, the leader of Egypt's largest Christian denomination, gave his blessings to Morsi's ouster, appearing on television alongside army chief Abdel Fattah El-Sisi and other political and religious figures when El-Sisi announced Morsi's removal. Although Sunday's shooting is expected to deepen a sense of insecurity amongst Christians living in a predominantly Sunni Muslim Egypt, some view such "terrorist" attacks as a threat to the whole country, and not just its Christian minority. "It's not a discrimination against Christians. It is rather discrimination against Egypt and Egyptians altogether, but Christians still pay a very, very, high price," lamented priest Yustos Kamel. I always thought in Islam the killing of innocents/civilians was prohibited. Are there exceptions to this rule? The victims were attending a wedding, not plotting against anyone. Those who try to excuse these actions insult Islam far more than any preacher burning a Koran. How do we know that Islamists did it? Could it not be that godledd secularists did it? After all thousands of Egyptians have been killed and not a single police officer has been indicted for the murder. Frankly, I find your comment overly simplistic and gullible. How long are we going to take this from the Religion of Peace? If Islam is not the religion of peace, then which religion is? Christianity whose god ordered the ,assacre of men, wimen and children and oxen and beasts...not to leave a breathing thing...and whose followers exterminated tens of millions and called the genocide manifest destiny? The truth of the mattwer is that Muslims in Egypt, not just Islamists are afraid that Islam itself, not just the Muslim Brotherhood, is being targeted by a sinister coalition of Communists, Copts, Free Masons and other atheists. Hence, the battle of life or death being waged now in Egypt. Besides, the Islamists are excluded and banned and imprisoned by the fascist authority. They have no choice but to go underground...and be it as it may.